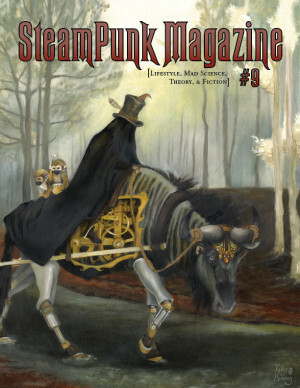 Steampunk Magazine » Register & Contribute to the SPM Website! Register & Contribute to the SPM Website! As we mentioned yesterday the Gaslamp Bazaar is closed for the foreseeable future. However, as promised, we’ve been looking into how to make the SteamPunk Magazine more community-orientated, and we are happy to announce that you can now register your very own SPM account. Once registered, you will be able to manage your profile, comment on articles, talk to other users, and even submit articles and blog posts to us for publication here on the website. To register, please go here, or use the ‘Login’ section at the top of this page. We are very much looking forwards to hearing from you all, and hope to bring you more guest posts and articles from our readers, writers, artists and contributors in the coming weeks. Wow am I really the first logged in user? No, but you are the first to have posted here. I’m excited for the change myself, but after some private correspondence with Allegra about a book review, I’m a bit quiet – trying to prepare it to the strictures and standards of this community!